Not to be confused with Patrington. This article is about the town in England. For people with the surname Partington, see Partington (surname). For the neighbourhood in Australia, see Partington, Queensland. 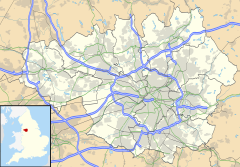 Partington is a town and civil parish in the Metropolitan Borough of Trafford, Greater Manchester, England, ten miles (16 km) south-west of Manchester city centre. Historically part of Cheshire, it lies on the southern bank of the Manchester Ship Canal, opposite Cadishead on the northern bank. It has a population of 7,327. A paper mill built in Partington more than 250 years ago was the first factory in Trafford. The completion of the Manchester Ship Canal in 1894 transformed Partington into a major coal-exporting port and attracted a range of other industries. Until 2007 Shell Chemicals UK operated a major petrochemicals manufacturing complex in Carrington, Partington's closest neighbour, to the east. The gas storage facility in the north-eastern corner of the town was once a gasworks and another significant employer. Partington and Carrington Youth Partnership was established to provide the town's youth with activities and the town has seen investment in a new youth centre. Broadoak School, the only secondary school in the town, is used by Trafford College to provide further education. Partington, first recorded in 1260, was in the medieval and post-medieval parish of Bowdon. The name derives from Old English: the first element may be a personal name such as Pearta or Pærta, or part "land divided up into partitions" followed by inga, meaning "people of"; the suffix tun means "farmstead". The village consisted of dispersed farmsteads, with no nucleated centre. It was surrounded by wetlands on all sides, reducing the amount of land available for agriculture. According to the hearth tax returns of 1664, Partington had a population of 99. In 1755 a paper mill on the River Mersey was opened in Partington, the first factory to be established in present-day Trafford. Erlam Farmhouse dates from the late 18th century and is a Grade II listed building. Also protected as a Grade II listed building are the stocks on the village green. Its stone pillars are from the 18th century, although the wooden restraints were replaced in the 20th century. The completion of the Manchester Ship Canal in 1894 transformed Partington into a major coal-exporting port. The canal was widened to 250 feet (76 m) for three-quarters of a mile (1.2 km) to allow for the construction of a coaling basin, equipped with four hydraulic coal hoists. Partington was the nearest port to the Lancashire Coalfields, and brought the south Yorkshire collieries 30 miles (48 km) closer to the sea. Between 1898–1911, exports of coal accounted for 53.4 per cent of the total export tonnage carried by the ship canal. The coal trade in turn resulted in Partington becoming a major railway depot, and attracted a range of other industries, including the Partington Steel & Iron Company, which was encouraged by the availability of coal to construct a steelworks. The works became a part of the Lancashire Steel Corporation in 1930, and dominated the economy of nearby Irlam until their closure in 1976. After the Second World War, Partington was extended as an overspill estate. The civil parish of Partington was created in 1894, under the Local Government Act 1894 and has its own town council. Partington became part of the Metropolitan Borough of Trafford in 1974 upon the borough's creation, but was previously in Bucklow Rural District. The town is part of the Bucklow St Martin electoral ward; Partington Parish Council is made up of local residents and ward councillors. Partington also belongs to the Stretford and Urmston constituency and is part of the North West England constituency of the European Parliament. Since its creation in 1997 the constituency's Member of Parliament has been a member of the Labour Party, Kate Green being the present incumbent. At 53°25′12″N 2°25′48″W﻿ / ﻿53.42000°N 2.43000°W﻿ / 53.42000; -2.43000 (53.42, −2.43), Partington lies west of Sale, north-east of the civil parish of Warburton, and is on Trafford's northern border with the City of Salford. It is nine miles (14 km) south-west of Manchester city centre. Sinderland Brook runs east–west through the area, and the town is about 20 m (66 ft) above sea level on generally flat ground. Partington's local drift geology is a mixture of alluvial deposits, fluvio-glacial gravel, and peat deposited about 10,000 years ago, during the last ice age. The bedrock is Keuper sandstone in the south and Bunter sandstone in the north. The town's climate is generally temperate, like the rest of Greater Manchester. The mean highest and lowest temperatures (13.2 °C (55.8 °F) and 6.4 °C (43.5 °F)) are slightly above the national average, while the annual rainfall (806.6 millimetres (31.76 in)) and average hours of sunshine (1394.5 hours) are respectively above and below the national averages. According to the Office for National Statistics, at the time of the United Kingdom Census 2001, Partington had a population of 7,723. The 2001 population density was 5,348 inhabitants per square mile (2,065/km2), with a 100 to 93.1 female-to-male ratio. Of those over 16 years old, 34.7% were single (never married), 34.9% married, and 10.5% divorced. Partington's 3,354 households included 33.5% one-person, 28.7% married couples living together, 8.8% were co-habiting couples, and 16.3% single parents with their children. Of those aged 16–74, 38.9% had no academic qualifications, significantly higher than the averages of Trafford (24.7%) and England (28.9%). It has been described as one of the most deprived places in the Greater Manchester conurbation. As of the 2001 UK census, 76.8% of Partington's residents reported themselves as being Christian, 0.8% Muslim, 0.2% Hindu, 0.2% Jewish, and 0.1% Sikh. The census recorded 14.7% as having no religion, 0.1% had an alternative religion and 7.1% did not state their religion. The main shopping area of Partington is on Central Road, in the centre of town. Partington also has a traditional market on Smithy Lane. Spanish company, SAICA, bought a lease on a disused wharfside site by the Manchester Ship Canal in 2009 to recycle paper into packaging. The plant is the most "advanced, fully integrated facility in the UK". It uses water recycled from the ship canal and its heat and power plant supplies surplus power to the national grid. The plant cost £300 million and production started in January 2012. According to the 2001 UK census, the industry of employment of residents aged 16–74 was 19.3% retail and wholesale, 15.0% manufacturing, 14.7% property and business services, 10.8% health and social work, 9.1% transport and communications, 7.2% construction, 5.2% education, 4.8% hotels and restaurants, 3.8% finance, 3.1% public administration, 1.3% agriculture, 0.7% energy and water supply, 0.1% mining, and 4.9% other. Compared with national figures, Partington had a relatively high percentage of residents working in transport and communications, and a relatively low percentage working in public administration. The census recorded the economic activity of residents aged 16–74, 1.8% students were with jobs, 3.4% students without jobs, 7.7% looking after home or family, 10.6% permanently sick or disabled, and 3.8% economically inactive for other reasons. The proportion of those who were permanently sick or disabled in Partington was above the Trafford and England average (5.4% and 6.5% respectively). Trafford maintains a selective education system assessed by the 11-plus exam. There are three primary schools and one secondary school in Partington. The oldest school still standing in the town was opened in 1958 and used to be called Partington County Primary School. There is one other state primary schools at Forest Gate with Academy status. There is also a Roman Catholic school – Our Lady of Lourdes Primary School on Lock Lane. Broadoak School is a secondary school with academy status for pupils aged 11 to 16. Founded in 2003 as part of a government project for 11- to 19-year-olds, Partington and Carrington Youth Partnership (PCYP) has since expanded its scope and provides facilities for youths up to the age of 25. It runs a 5-a-side football league and Screamin' Wheels Skate Park. In 2009 it was announced that a £5 million youth centre would be built in the town. Based on designs by pupils from Broadoak Secondary School, the centre will provide facilities for workshops in dance, film-making, and art. Headmaster of the school, Andy Griffin, said "It's a massive thing for Partington as this will help kick-start regeneration of the town. I think it will also help bring people to Partington rather than leaving". Providing opportunities for sport, a £2 million sports complex was opened next to Broadoak Secondary School in 2008. It features a pool, a sports hall, outdoor pitches and grass courts, and facilities for other activities. The town is served by an Anglican church, St Mary's, a Roman Catholic church dedicated to Our Lady of Lourdes, a Methodist chapel, and a Baptist church called the People's Church. St Mary's Church is a Grade II listed building, and Our Lady of Lourdes' RC Church and parish was founded in 1957. Partington is in the Catholic Dioceses of Roman Catholic Diocese of Shrewsbury and the Anglican Diocese of Chester. ^ "Partington Parish Council - Partington, Manchester". www.partingtonparishcouncil.co.uk. Archived from the original on 20 October 2017. Retrieved 24 April 2018. ^ "Greater Manchester Gazetteer". Greater Manchester County Record Office. Places names – O to R. Archived from the original on 18 July 2011. Retrieved 26 September 2007. ^ Lab, Trafford Innovation and Intelligence. "Indices of Deprivation 2015 - Trafford Innovation and Intelligence Lab". www.infotrafford.org.uk. Archived from the original on 2 June 2016. Retrieved 24 April 2018. ^ Nevell (1997), p. 24. ^ Nevell (1997), p. 89. ^ "Erlam Farmhouse, Bailey Lane". English Heritage. Archived from the original on 23 October 2012. Retrieved 20 April 2009. ^ "Stocks, Partington". English Heritage. Archived from the original on 23 October 2012. Retrieved 20 April 2009. ^ Farnie (1980), p. 98. ^ Nicholas Timmins (26 June 1995). "Two Labour councils set to relinquish housing". The Independent. Archived from the original on 26 October 2012. Retrieved 20 April 2009. ^ "Bucklow St Martin ward profile". Trafford MBC. Archived from the original (PDF) on 8 February 2012. Retrieved 30 November 2007. ^ "Stretford and Urmston". The Guardian. Archived from the original on 27 September 2013. Retrieved 1 February 2012. ^ Nevell (1997), p. 26. ^ Nevell (1997), p. 1. ^ Nevell (1997), p. 3. ^ "Manchester Airport 1971–2000 weather averages". Met Office. 2001. Archived from the original on 29 September 2007. Retrieved 12 August 2008. ^ Met Office (2007). "Annual England weather averages". Met Office. Archived from the original on 5 June 2011. Retrieved 23 April 2007.
. Archived from the original on 12 September 2011. Retrieved 19 April 2009. ^ a b "Trafford Metropolitan Borough key statistics". Statistics.gov.uk. Archived from the original on 26 December 2007. Retrieved 19 April 2009. ^ "Western Gateway/Trafford UDP". Salford City Council. 8 January 2002. Archived from the original on 27 August 2011. Retrieved 20 April 2009. ^ "SAICA Recycled Paper Plant, United Kingdom". Packaging Gateway.com. Archived from the original on 8 May 2016. Retrieved 3 May 2016. ^ "SAICA kicks off production at £300m paper mill". Packaging News. 23 January 2012. Archived from the original on 3 June 2016. Retrieved 3 May 2016.
. Archived from the original on 12 September 2011. Retrieved 18 April 2009. ^ a b "Trafford Local Authority economic activity". Statistics.gov.uk. Archived from the original on 26 December 2007. Retrieved 18 April 2009.
. Archived from the original on 12 September 2011. Retrieved 18 August 2009. ^ "Welcome - Broadoak School". Broadoak School. Archived from the original on 20 October 2014. Retrieved 24 April 2018. ^ Nicholls (2004), p. 90. ^ a b "Get on Board: An agenda for improving personal security – Case studies; 12. Community Transport the Nightlink Service, Manchester Mini-Bus Agency". Department for Transport. Archived from the original on 9 October 2009. Retrieved 19 April 2009. ^ "Station Name: PARTINGTON (2nd site)". Disused Stations Site Record. Archived from the original on 1 September 2007. Retrieved 30 October 2007. ^ "Partington & Carrington Youth Partnership: History". Partington & Carrington Youth Partnership. Archived from the original on 5 September 2008. Retrieved 21 April 2009. ^ "Activities for children over the summer school holidays". Trafford.gov.uk. Archived from the original on 21 November 2008. Retrieved 21 April 2009. ^ a b "£5m youth club plan". Manchester Evening News. 17 March 2009. Retrieved 21 April 2009. ^ "New £5m youth centre for Partington". Messengernewspapers.co.uk. 15 March 2009. Archived from the original on 11 April 2010. Retrieved 21 April 2009. ^ "Partington". Traffordleisure.co.uk. Archived from the original on 11 June 2009. Retrieved 21 April 2009. ^ "Planning and building control: listed buildings". Trafford MBC. Archived from the original (PDF) on 16 July 2011. Retrieved 22 April 2009. ^ "Our Lady of Lourdes RC Church, Partington, parish history". Our Lady of Lourdes RC Church, Partington. Archived from the original on 7 October 2011. Retrieved 22 April 2009. ^ "Catholic Diocese of Shrewsbury". Dioceseofshrewsbury.org. Archived from the original on 17 April 2009. Retrieved 22 April 2009. ^ "Churches in the Diocese of Chester". Chester.anglican.org. Archived from the original on 15 April 2009. Retrieved 22 April 2009. Farnie, D. A. (1980). The Manchester Ship Canal and the rise of the Port of Manchester. Manchester University Press. ISBN 0-7190-0795-X. Warburton, Norman (1970). Warburton: The Village and the Family. Research Publishing Company. ISBN 0-7050-0007-9. Wikimedia Commons has media related to Partington.